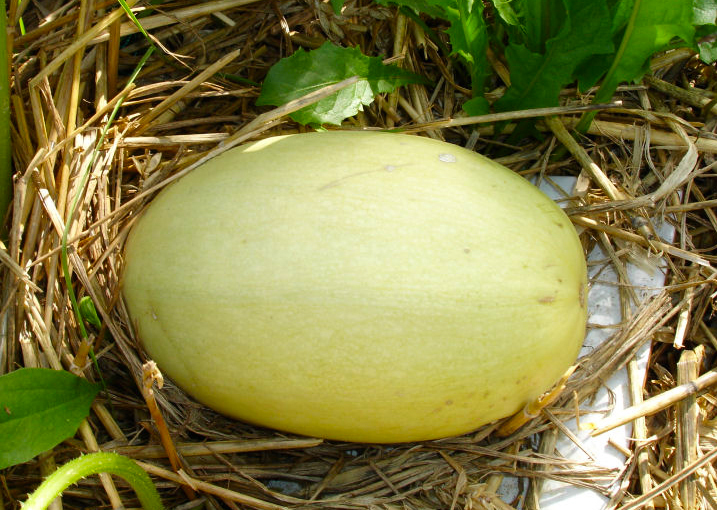 This is a spaghetti squash. In a just world, the spaghetti squash should be having its 15 minutes of fame about now, as it is the original light, gluten-free alternative to pasta that needs no expensive spiralising equipment, just a 30-minute bake in the oven. Instead, its brash skinny cousin, the courgette, steamed in and stole all the limelight, with its fancy gadgets and flashy green outer skin. Of course, courgettes are also readily available in the supermarket, and they fruit in huge numbers every summer, leaving gardeners wondering how to deal with them all. The spiraliser and its transformation into 'courgetti', long strands that can stand in for pasta without giving you a heavy carb or gluten overload, have turned courgettes into a must-have vegetable, leaving the much more naturally gifted spaghetti squash stranded in its wake. A hefty 2kg spaghetti squash (such as the large yellow squash, lower right, above) can be baked in the oven, exactly as is, for 30 minutes, or until a knife slides easily into the flesh. 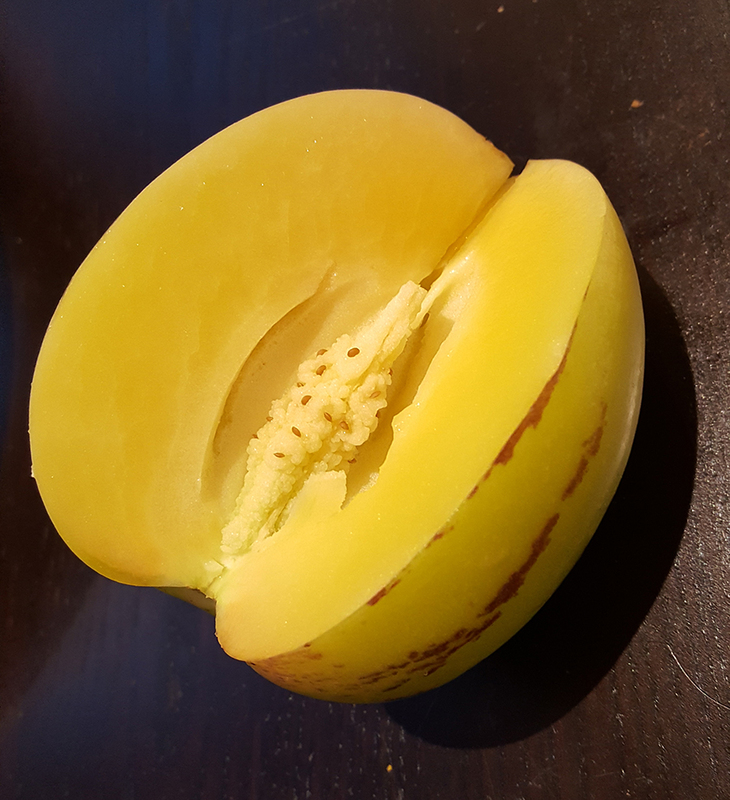 Remove from the oven and slice in half lengthways, then spoon out the seeds. Now rake a fork over the cut surface of the squash. You'll find the flesh separates and falls quite naturally into spaghetti-like strands. Hence the name. One squash serves two easily, three at a push. They have a mild nutty taste, not as 'green' as a courgette, and shouldn't be in any way watery. They go well with the conventional pasta sauces although I'm also quite happy to stir in some butter or olive oil, season with a little salt and lots of pepper, then dust with parmesan. 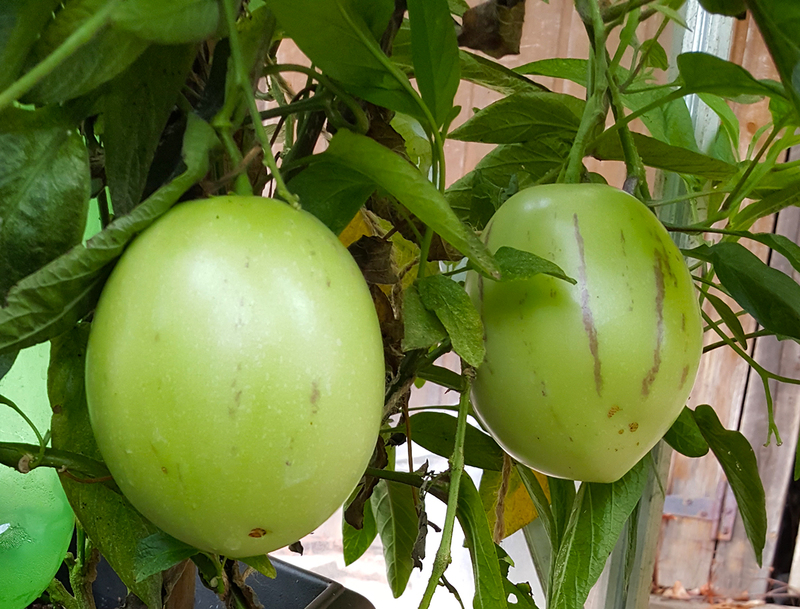 ripening fruits undamaged from sitting on damp ground and away from slugs. Spaghetti squash are one of the easier squash to grow. They germinate readily, sown indoors, two to a pot, sometime in April and then being transplanted outdoors in May or June, once it has a set of true leaves and looks like it's getting too big for its 9cm pot. Squash like rich moist soil, so it's worth digging manure into the squash bed before you transplant and then feeding the plants well once established. I like to train squash up a plastic mesh trellis or fence so that the fruit hang down but don't touch the ground: otherwise they will sprawl everywhere and take over your garden/allotment, and will be more vulnerable to slugs and snails. Apart from that, I confess, I leave them well alone. I don't really know why spaghetti squash never make it into the shops. 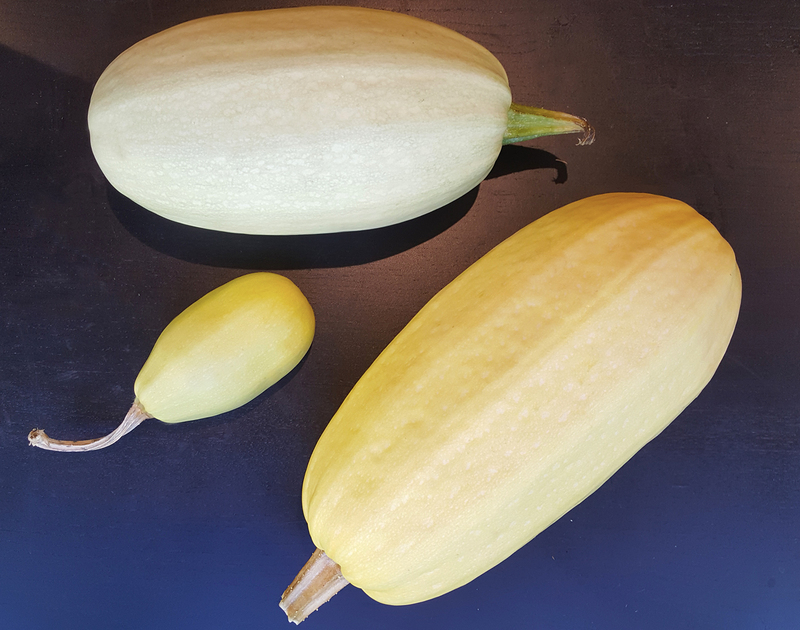 They're easy to grow, relatively prolific, good storers ... now that so many supermarkets find space for Crown Prince, onion squash and some of the more ornamental gourds, you'd think they could find a corner for the self-spiralising spaghetti squash. If the squash does develop at ground level, slip a tile underneath so that it doesn't sit in the dirt. 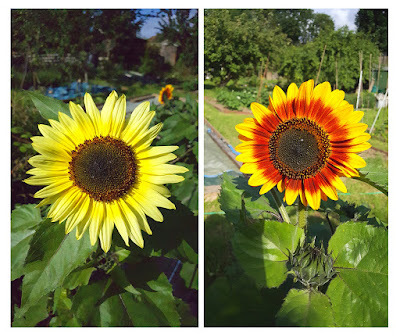 Flowers are a joyful addition to the allotment, not just because they are easy on the eye, but also for the sheer pleasure of watching bees and hoverflies dig deep for their nectar. The satisfaction of seeing bees heavy with pollen. The cosmos I plant in and around the globe artichokes and then forget about until I see them standing tall and colourful and dancing manically in the breeze. 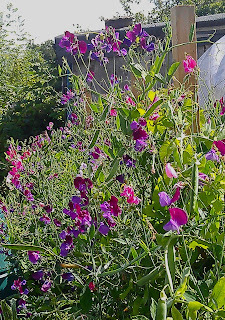 The sweet peas I plant everywhere because their colour and fragrance makes weeding nearby a pleasure. 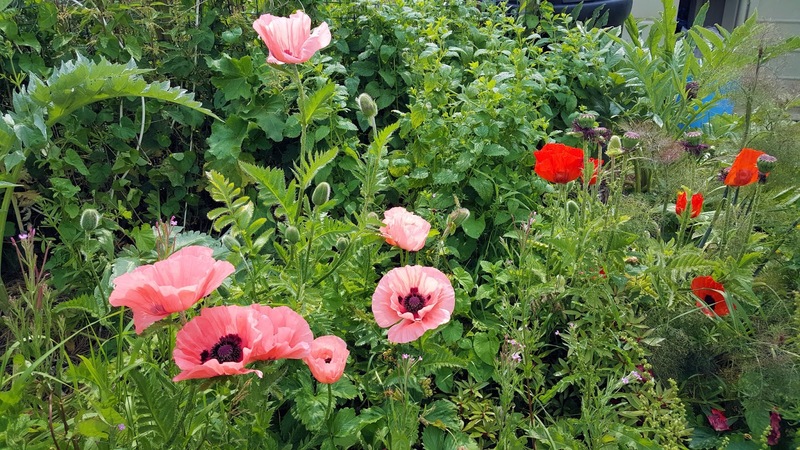 The poppies that burst through the wilderness at the top of the plot that I vow every year I will clear. The daffodils and the bluebells that need no care, no fussing over, but come up year after year under the plum tree and tell everyone who passes by that spring is here. Once this year’s shallots were harvested in early July, I had an entire raised bed left vacant without a plan for filling it. And since nature abhors a vacuum, you can be sure the weeds were queueing up for the chance to settle in there. 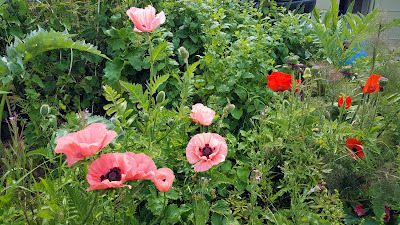 In something like desperation, I planted out a few spare chilli seedlings and, to fill the gaps, transplanted some nasturtium seedlings that didn’t make it into the vertical garden, and then flung in some eschscholzia which I sowed – way out of date, but hey, if they come up, they come up – in June and never really expected to come through. 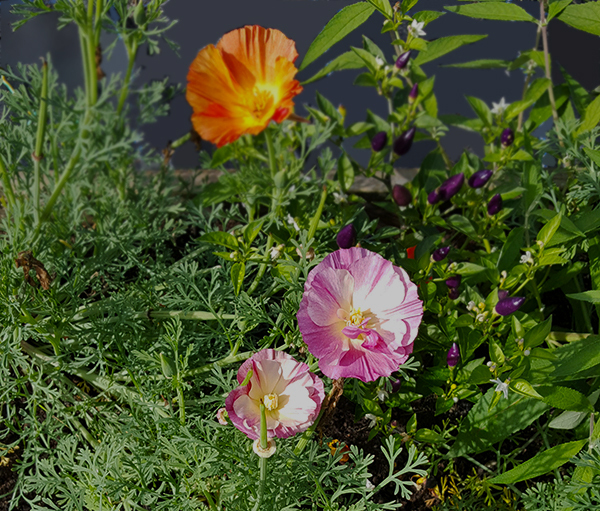 Thanks to some lovely warm days in the last month, this bed is now in full bloom in mid-October – and as a bonus the chillies are fruiting like mad – which is hugely comforting as many of the other beds are coming to an end and waiting to be dug over. 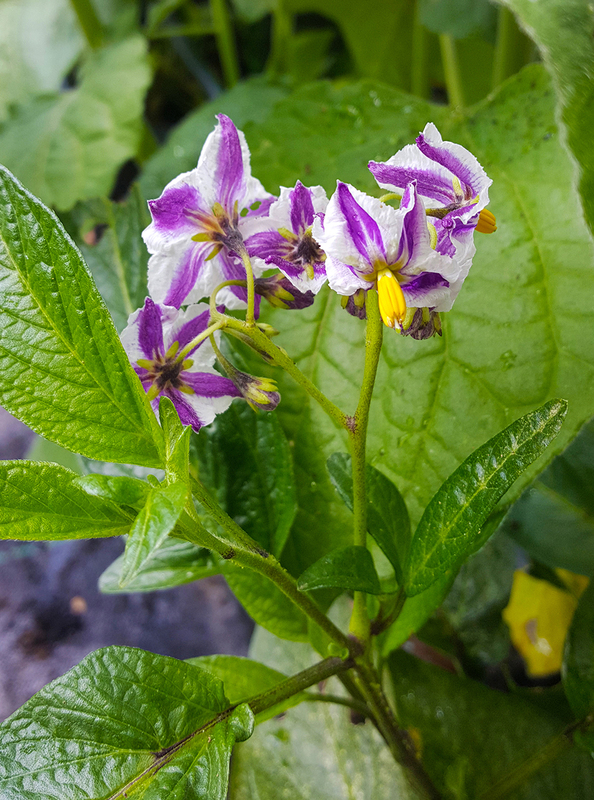 The bed has also sprung a self-sown buddleja, which I will transplant to somewhere more suitable, and the aubergine seedling is struggling out in the exposed open ground, but everything else is loving the warmed soil, autumn sunshine and increased rainfall. 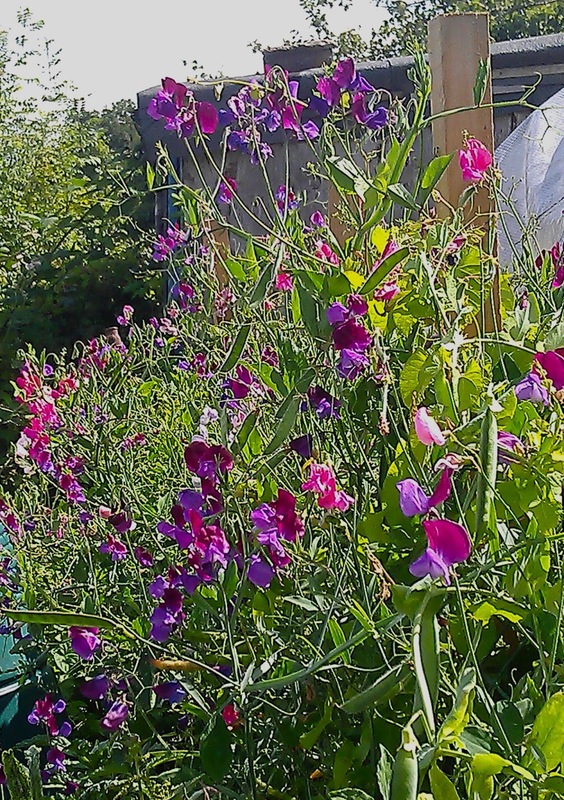 I think there’s always a place on the allotment for flowers. Not least because so many are edible and can count as produce: chives, nasturtiums, violas, bergamot, for example. 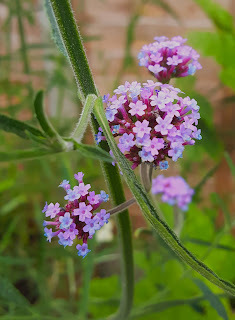 Then there are those we grow as companion plants: I have chives – way more than I would ever snip into a potato salad – and Calendula, to keep away a number of pests. I’ve also raised Tagetes in the polytunnel (Homebase was selling those polystyrene boxes at £1.50 for nine plants in mid-season for some reason) and we’ve had no white fly at all, although it’s possible we might not have had them this year in any case. I have an area of about 3-4 poles to clear this winter and I’ve already decided that flowers will be a central part of this bit of the plot. There will be a buddleja hedge of many colours: deep blue, crimson, cerise, and white – everything except railway-embankment mauve, really. It’s a sunny spot so there will be sunflowers and more poppies and achillea and cornflowers, all designed to bring in the beneficial insects. Without the pollinators, the fruit and vegetables will be left high and dry and so really the flowers should come first.